Posted by dr. gonzo in Architecture, Houses, National Register of Historic Places. You don’t have to travel far from the Chauncey Ellwood House in Sycamore, Illinois to locate the subject of this post, it’s right next door, at 825 Somonauk Street. The Esther Mae Nesbitt House, another member of the Sycamore Historic District, has its origins back in 1837, as a carriage house for the subject of yesterday’s post, the Chauncey Ellwood House. 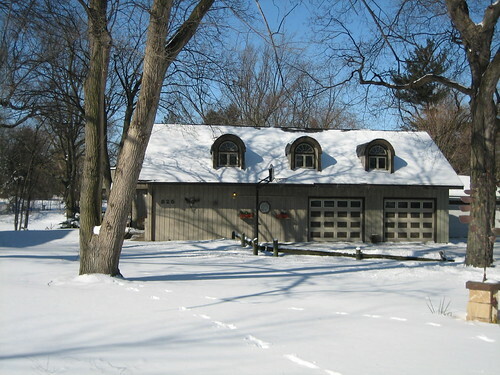 Esther Mae Nesbitt was born in 1913 and eventually converted the carriage house into an artist’s studio and home, much of the building isn’t visible in the above image as it spreads out behind the front facade. Nesbitt served in the Women’s Army Corps during World War II, rising to the rank of Master Sergeant. She was awarded the French Croix de Guerre for her work as a commander during the war. Nesbitt died in 1972, establishing a scholarship trust in her name. The Nesbitt Medical Student Foundation aims to help a medical student with the costs associated with medical school. Tomorrow we walk a few blocks south to take in another of my favorites in Sycamore.